In news that is sure to be welcome to tenants who were recently on the receiving end of mid-lease increases, those who were led to believe by a leasing agent that they wouldn’t be getting mid-lease hikes will not have to pay their new, higher rents. CompassRock said if tenants were in that situation then they should fill out an affidavit, which was attached to Knapp’s letter, with details of statements made to them, including emails or other documentation if available, and their rents would stay the same. The deadline for tenants to file their paperwork is June 30. Otherwise, they’ll have to pay their new, inflated rent starting July 1. 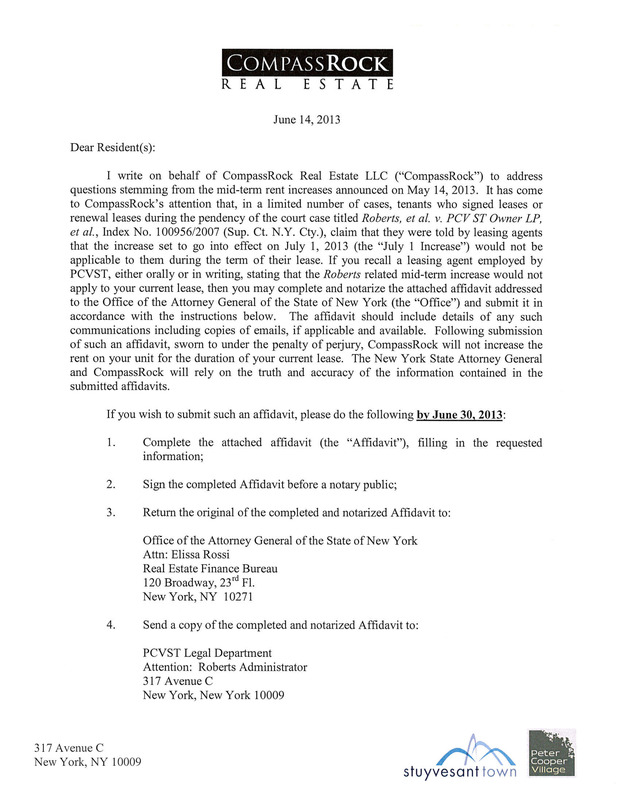 The notice came after Attorney General Eric Schneiderman conducted an investigation into allegations of tenants being misled by leasing agents. The matter was brought to the A.G. by Council Member Dan Garodnick after he said he’d heard complaints from numerous tenants. As of this week, Garodnick said there were a total of 39 tenants who said they were told, inaccurately, they wouldn’t be getting a mid-lease increase. As for tenants who have no written proof of agreements that there would be no mid-lease hike, but have said they were told it wouldn’t happen, the rent rollbacks would apply to them as well. “It is our understanding that verbal assurances will be treated the same way as written evidence, but there does need to be some sort of description” of statements, said Matt Mittenthal, press secretary for the attorney general. Or, as the notice from CompassRock went on to suggest, tenants could also avoid paying the new rents simply by moving out. The letter concluded by saying nothing “should be construed as an admission of wrongdoing or liability” against CompassRock or CWCapital. Schneiderman added that the agreement means CW can’t impose any additional mid-lease rent hikes and, he noted, he’d be watching the special servicer to make sure of this. “My office will keep a close watch in the coming weeks to ensure that all aspects of the agreement are honored,” Schneiderman said. Even before Roberts was settled, attorneys were already warning tenants that CW could issue rent hikes, even mid-lease, as a result of language the special servicer had inserted into new leases. Rent hikes have reportedly been as high as over $2,000, although most are in the hundreds. In response to the investigation and the agreement, CW said in an official statement that management had only known about 10 incidents of misrepresentations regarding the increases. “Despite an exhaustive effort to solicit complaints from residents that leasing agents had represented mid-term rent adjustments would not occur, we have received only 10 complaints from affected residents,” CWCapital said on Tuesday. This article has been updated to include quotes from CW Capital and Attorney General Schneiderman. Great work by Dan Garodnick! I never heard any lawyer warning tenants about a mid-lease rent hike before Roberts was settled. Where did that come from? Is this for real? I am thoroughly confused. We were definitely told to disregard any rider and that our rent was secure…but all we have to do is state that in an affidavit and we’re reprieved?